Gigabit Ethernet switch is an essential part of communication systems. It is widely used as the access layer switch, which facilitates the connection of end node devices to the network. The Gigabit Ethernet switches on the market mainly differ in port and function. Then which to choose from so many options of Gigabit switches on the market? FS newly launched the S3900 series Gigabit Ethernet switch. It is designed with an advanced feature set that brings high availability, comprehensive security, robust multicast control, and advance QoS to the network edge, while maintaining simple management. Let’s know more about the S3900 series Gigabit Ethernet switch. FS.COM S3900 series Gigabit Ethernet switch is advanced layer 2 plus (layer 3 Lite) Gigabit managed stackable switch with 10G uplinks, which can satisfy the demand for the future network upgrade. The S3900 series switches are the ideal Gigabit access and aggregation switch for SMB, enterprise, and campus networks. The S3900 series of switches are equipped with 24/48 ports, copper/SFP ports. All of S3900 series switches are managed stackable switches. The most distinctive characters of the S3900 series switch are listed below. FS.COM S3900 series Gigabit Ethernet switch has the switching capacity up to 128Gbps/176Gbps. 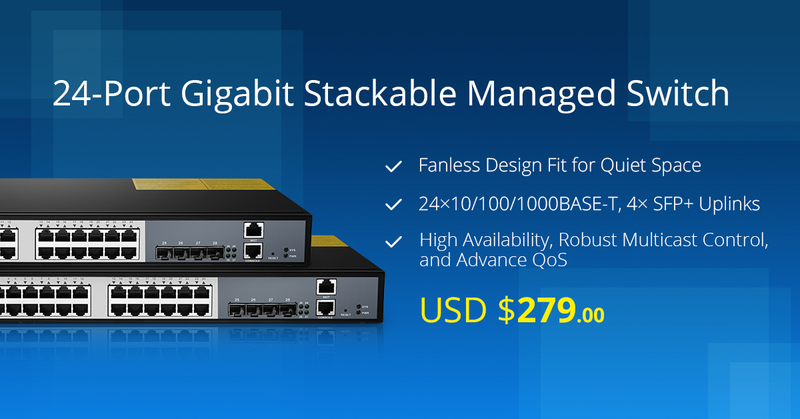 It delivers wire-speed switching performance on all Gigabit ports and takes full advantage of existing high-performance Gigabit CPEs, PCs, 11n/ac Wi-Fi applications, etc. Besides, it significantly improves the responsiveness of applications and shortens file transfer time. Moreover, the 4 built-in 10G SFP+ ports provide uplink flexibility, and create 10 Gbps high-speed uplinks to 10 GbE switch or device through the connection of 10G SFP+ transceivers or 10G SFP+ DACs, thus reduce bottlenecks and increase the performance of the access network. Except for the 10G uplinks, S3900 stackable switches also have the potentiality of adding extra available ports in the future. Besides, the stackable switches which are stacked together can be managed as an entity, thus save the time and energy when you manage the stackable switches. The design of the S3900 series incorporates high energy efficiency which can greatly expand your network capacity with much less power. The fanless design of S3900-24T4S ensures noiseless operation without disturbing your family or your staff and increases the reliability of the system. The S3900 series switch is an eco-friendly solution for your family and business network. The S3900 switch is equipped with IGMP snooping technique which prevents the flooding of multicast traffic. The multicast traffic is forwarded to only those ports associated with an IP multicast receiver. Thus the technique reduces unnecessary load on host devices. With industry-standard command-line interface (CLI) program, which is accessed through the console port or telnet, the S3900 series Gigabit switch provides superior management user experience. Besides, user-friendly web interface helps users to quickly and simply configure switches. FS.COM S3900 series switch contains STP protocols. IEEE 802.1w rapid spanning tree protocol provides a loop-free network and redundant links. IEEE 802.1s multiple spanning tree protocol runs STP per VLAN base, providing layer 2 load sharing on redundant links up to 64 instances. The STP protocols prevent bridge loops and the broadcast radiation and also allow a network design to include backup links to provide fault tolerance if an active link fails. The following chart shows the details of the three types S3900 Gigabit Ethernet switch. You can choose from them according to your actual needs. Which to Choose Among S3900 Series Gigabit Ethernet Switch? When it comes to choosing from FS.COM S3900 Gigabit Ethernet switch, you need to consider the number and type of ports you need and whether the switch is fanless or with fans. What are the Port Type and Port Number You Need? FS.COM S3900 series Gigabit Ethernet switches offer three different port combination options. You can choose from them according to your network demands. If you need 24 port Gigabit switch, both S3900-24T4S switch with 24 10/100/1000BASE-T ports and S3900-24F4S switch with 24 SFP ports are within the scope of consideration. Then which to choose between S3900-24T4S switch and S3900-24F4S switch? It depends on your need. If cost, backward compatibility with legacy copper cabling networks, power consumption are important for you, S3900-24T4S switch with 24 10/100/1000BASE-T ports is the better choice. If you prefer lower latency and switches with combo SFP ports then you could consider S3900-24F4S switch with 24 SFP ports which contain 4 combo ports. To make it clear, a combo port is both a copper port and an SFP port sharing the same switching fabric and ID but connect to different transmission media. The two ports can’t be at the same time. When either of the two ports is enabled, the other port is automatically disabled. It gives users the options and flexibility to configure their switch for their unique application requirements. Besides, the S3900-24T4S switch with copper ports is connected with Ethernet cables with the transmission distance of no more than 100m. While the S3900-24F4S switch with SFP ports is connected with SFP fiber optic transceiver modules & fiber patch cables with the transmission distance of 550m to 150km. So, S3900-24F4S switch is more suitable for long distance transmission, while S3900-24T4S switch is more suitable for short distance transmission. If the network devices you are going to connect are of large amount, and you have a relatively big network, then you need to choose a switch with more than 24 ports. The S3900-48T4S switch with 48 10/100/1000BASE-T ports can satisfy your demand. It has the switching capacity of 176Gbps, which is the largest among the S3900 series switches. Fanless Switch or Switch With Fan? If you are planning to use the switch in quiet space, like offices, home, shops, libraries, hospitals or clinics where noise can be an issue, FS.COM S3900-24T4S fanless switch is recommended. Fanless switches are equipped with a passive cooling system, which has the advantage of energy efficiency and lower financial cost. The switches with fans are mostly deployed in data centers which have separate data center rooms. While fanless switches are more suitable for small business, people working at home, and places where silence is needed. FS.COM S3900 Series Gigabit Ethernet switch has high availability, comprehensive security, robust multicast control, and advanced QoS. The article extensively discussed why you choose the S3900 series and how to choose the most suited switch for your network among the S3900 series. If you want to purchase FS.COM S3900 series Gigabit Ethernet switches or other network switch such as 10GbE switch, 40GbE switch and 100GbE switch, please contact us at sales@fs.com. How to Configure Inter VLAN Routing on Layer 3 Switches? With the development of technology, no matter how far you are away from families, you can communicate with them at any time in any places. The same is true to the optic communication, regardless of the physical locations of two hosts or the different VLANs they belong to, they can exchange with each other by inter VLAN routing. Then what is inter VLAN routing and how to configure inter VLAN routing on layer 3 switches? What Is Inter VLAN Routing? In figure 1, three computers connected to a gigabit Ethernet switch form a LAN (local area network) within a limited area. However, they cannot communicate with hosts in another LAN, because there is no connection between these Ethernet switches. Then there comes the VLAN which provides us with logical separation or segmentation of our networks to facilitate communication among hosts in different LANs. However, each VLAN is a unique broadcast domain, so computers on separate VLANs are unable to communicate with each other by default. There is a way to solve the problem, and that’s what we are going to shed light on—inter VLAN routing. The process of forwarding network traffic from one VLAN to another VLAN using routing is known as inter-VLAN routing. One of the ways to carry out inter-VLAN routing is by connecting a router to the switch infrastructure. When using a router to facilitate inter-VLAN routing, the router interfaces can be connected to separate VLANs. Devices on those VLANs communicate with each other via the router. Apart from that, a more convenient way is introduced—configure inter VLAN routing on layer 3 switches. 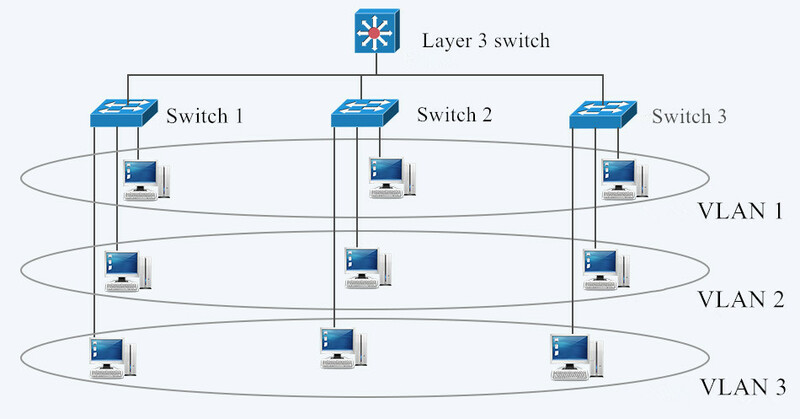 Layer 3 switching is more scalable than a router which only provides a limited number of available ports. To enable a layer 3 switch to perform routing functions, the switch must have IP routing enabled. 10gb Ethernet switch and 40gb Ethernet switch are recommended for working as layer 3 switch. 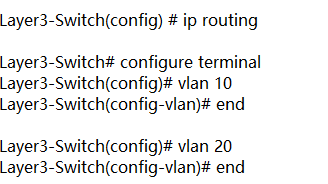 In figure 2, layer 3 switch is configured with IP address 10.0.0.1. 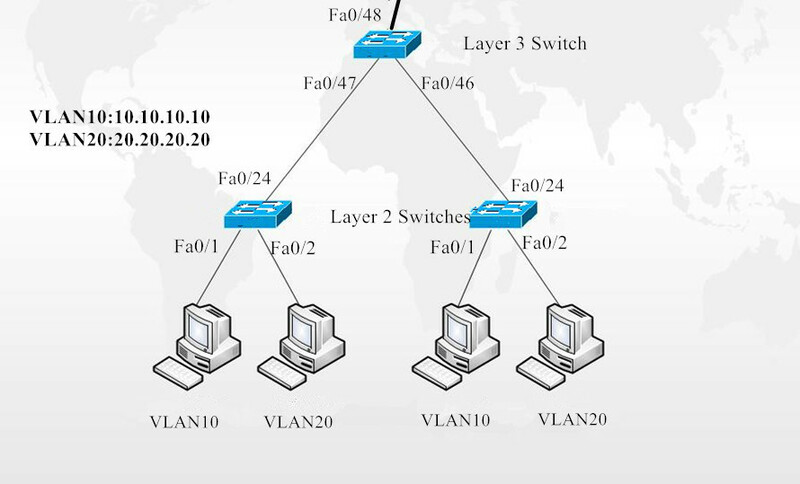 VLAN10 and VLAN20, with IP address 10.10.10.10 and IP address 10.20.20.20 respectively are configured on layer 2 switches. These two IP addresses will be the default gateway addresses for hosts belonging to VLAN10 and VLAN20 on the layer 2 switches respectively. Also, all interfaces connecting the three switches must be configured as trunk ports to allow VLAN10 and VLAN20 tagged frames to pass between switches. Traffic between VLAN10 and VLAN20 will be routed by the layer 3 switch after configuring inter VLAN routing. These steps can be achieved by VLAN configuration command below. VLAN is created to enable the communication among hosts in different LANs. Inter VLAN routing is developed to realize the exchange among hosts in different VLANs. Inter VLAN routing on layer 3 switch without a router is also approachable with the development of technology. For more configuration about network switches, please refer to our website www.fs.com. How to Add PoE to Your Network? In data centers, there are a lot of electrical devices and each one requires a power supply cable and at least one connection wire for transmission. It’s a disaster to see all those wires scattering all over the floor and tangling together. To introduce Power over Ethernet technology, we can cut down the number of wire drops and simplify the management control. So what’s the practical methods for adding PoE to your network? Read the following passage, to learn about the two solutions: adopting PoE switch or PoE injector. PoE requires PoE-enabled networking devices for power supply on the Ethernet cable. To realize this technology, there are two types of power sourcing equipment (PSE) for adopting: endspan (IEEE 802.3af refers to it as “endpoint”) and midspan. Endspan is an Ethernet switch that has built-in PoE data transmission circuitry. A midspan is an intermediary device between a non-PoE switch and powered devices (PD). Thereinto PoE injector is a frequently used available external midspan device. When you need to set up a new Ethernet network with power over Ethernet technology or you want to upgrade system and replace older non- PoE switches, employing endspan is a good choice. How to add PoE to your network by PoE switch? Just connect it to other network devices, and the switch itself will figure whether they are PoE supportable devices and control power automatically. There are various types of PoE switch available, ranging from “dumb” unmanaged one, smart partly managed one and fully managed one with advanced management. It is also various from port quantity, such as 8, 16, 24 and 48 port. 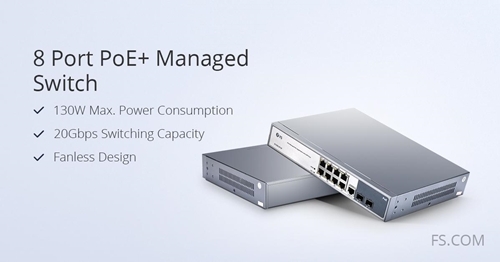 It is noted that the PoE+ switch is a PoE plus switch for providing up to 30W power consumption. For example, FS S1130-8T2F 8 port PoE switch is a managed PoE+ switch with 2 SFP port, IEEE 802.3at complied and IEEE 802.3af backward compatible. It has maximum power supply of 130W and switching capacity of 20Gbps. FS S1130-8T2F supports various PoE devices and is best fit for network equipment such as wireless APs, IP phones and weather-proof IP cameras. If you don’t want to discard your already used network switch and only PoE capability is needed to be added, you can simply adopt midspans. PoE injector is a device that can add electrical power while receiving signal from one end of the cable, and then deliver both the data signal and the power via the other end of the cable. Instead of PoE switch, midspan can also be used as an economical and functional solution where only a few PoE ports are in demand. How to add PoE to your existing LAN by PoE injector? First, power on PoE injector and non-PoE Ethernet switch respectively, next connect them via an Ethernet cable. Then connect PDs such as IP phones with PoE injector and finally the system can run as a whole. In the case of older end devices are not PoE-ready, a splitter can be helpful for adding PoE to your network. To apply a splitter onto the end of the Ethernet cable will enable signal and power to be split into two different lines. 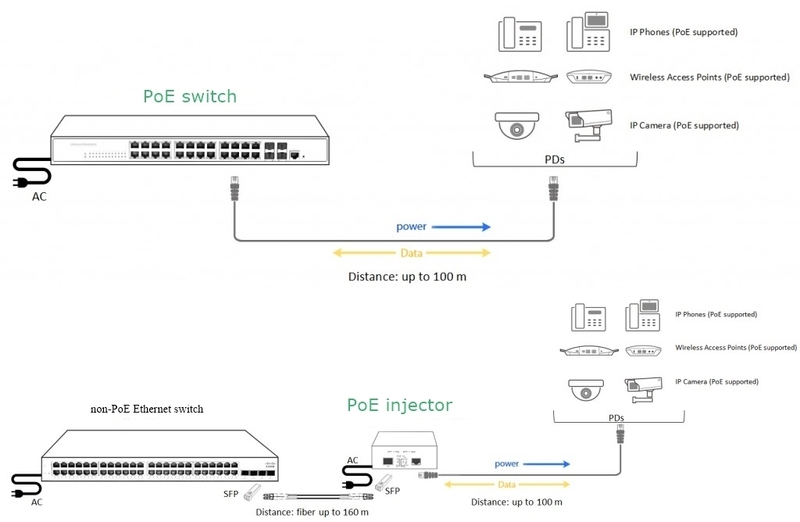 This figure shows the installation of PoE switch vs PoE injector for adding PoE to network. 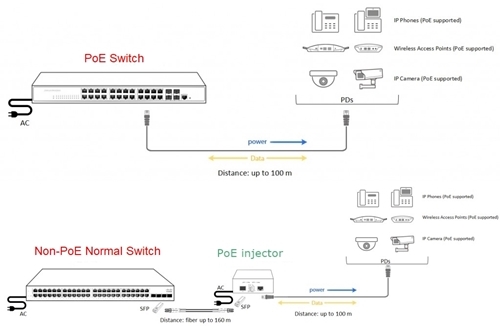 PoE Switch or PoE Injector: Which to Employ? After diving into each respectively, we made a comparison of PoE switch vs PoE injector for concerning about adding PoE to network. For most concerns about cost-efficiency and PoE capability required, you can go for PoE injector. However, for upgrading system and future-proof superior functionality concern, PoE switch is obviously a better choice. Both PoE switch and PoE injector are power sourcing equipment for adding PoE to a network. PoE switch is an endspan, naturally fitting for new set-up or upgrade-needed network. PoE injector is a midspan, better fitting for existing non-PoE network without switch replacement requirement. For PoE switch purchase, FS.COM is a reliable vendor providing a wide rage of types for different demands. Any other information to know, just visit our official website and blog.